Joseph of Arimathea was a prominent member of the Jewish council who believed that Jesus was the Messiah. Boldly, Joseph went to Pilate and asked for Jesus’s body. After confirming with a Roman officer, that Jesus was dead, Pilate released Jesus’s body to Joseph. Along with Nicodemus, Joseph took Jesus’s body from the cross. They wrapped the body in linen stripes and 75 pounds of mixed aloe and myrrh. The Jewish burial custom of using spices in burial linens was associated with covering the smell of the decaying body. Scholars suggested that because aloe had little odor, aloes were used to “fix,” or hold the scent of the myrrh. Based on my knowledge of aloe plants, I have another proposed reason for aloes in the linen grave cloths. Aloe gel is moist and slightly sticky. Perhaps, aloe gel didn’t so much “fix” the myrrh aroma in the linen cloths as hold them together and onto the body of the deceased. The aloe of the New Testament is the Aloe vera (Aloe barbadensis, Aloe vulgaris medicinal aloe). Some sources identified aloe as the oldest medicinal plant. Certainly, it figures prominently in ancient Egyptian medicine. In Israel, aloe grows as far south as Kibbutzim Lotan and Ketura in the Arava Desert near the Gulf of Aqaba. Old and New Testament aloe are from different species of plants. In contrast to New Testament aloe which is an herbaceous plant, Old Testament aloe comes from a tree. The Old Testament aloe tree was the eaglewood tree (Aquilaria malaccensis, A. agallocha). Likely, Old Testament traders brought aloe wood from India. Currently, aloe is used to reduce the pain of burns and scrapes. When aloe is harvested for its medicinal gel, older leaves are harvested because they contain more gel. I keep an aloe plant in my home. When I get a burn, I slice off a piece of aloe and rub the fluid on the burn, which takes the pain away. Isaiah wrote these prophetic words about Jesus, “But he was pierced for our transgressions, he was crushed for our iniquities; upon him was the chastisement that brought us peace” (Isaiah 53.5 ESV) Jesus’s body was dead; therefore, aloes couldn’t heal him; aloes couldn’t take away the sting of his death. Aloe couldn’t heal Jesus’s wounds. The healing aloes in Jesus’s burial cloth exemplified Jesus’s healing of mankind, not himself. After Jesus’s resurrection some individuals in Judea and the Roman Empire accepted healing from him. They accepted Jesus as Messiah, as the promised Savior of the world. Other individuals weren’t willing to be healed. Some couldn’t comprehend that a man would die for their sins. Others simply didn’t believe that they were all that bad; why would someone need to die for their few sins? For still others it was easier to continue their same religious observances, i.e., make an animal sacrifice or give a little money into a treasury, than to accept a new way of thinking. These individuals often want to cover over the smell of their sin rather than be healed of that sin. The rationale and rationalizations that individuals used 2,000 years ago for not accepting healing from Jesus are the same ones that individuals use today. In church on Sunday morning, we pray the “Prayers of the People.” Frequently, there are prayer requests for healing – surgery, diagnostic tests, cancer – from members of the congregation. I’m always surprised that congregates don’t offer more prayers for loved ones’ spiritual healing. My dear friend isn’t a Christian; I love him so much. From time to time, I ask congregates to pray that he comes to a saving knowledge of Jesus. I really should ask them to pray for him every Sunday. My friend needs the healing that only Jesus can give. Reflection: Like the reason for aloe in Jesus’s burial cloths, do you attempt to stick close to Jesus? What excuse do you give for not accepting Jesus as your Savior now? Reference: Mark 15:42-46 and John 19:38-42. Jewish law and custom required immediate burial of Jesus’ dead body. Mosaic Law required that Jews bury the body of a man put to death by hanging on a tree the same day he died (Deuteronomy 21:22-23). The reason for this Mosaic requirement was so that the land not be desecrated by a dead body remaining unburied. The book of Tobit (Apocrypha, 2009) described the value Jews placed on seeing that all slain Jews had a proper burial even when the Jews were in exile. Jesus’ crucified body died about 3:00 p.m. on Friday. By Jewish custom, Friday was the Day of Preparation for the Saturday Sabbath. Preparation Day ended at about 6:00 p.m. on Friday when the Sabbath began. No work was allowed on the Sabbath to include burying a dead body. Jesus followers had about three hours between the time he died and the start of the Sabbath celebration. Joseph of Arimathea was a prominent member of the Jewish council who believed that Jesus was the Messiah. Boldly, Joseph went to Pilate and asked for Jesus’ body. After confirming with the centurion that Jesus was dead, Pilate released Jesus’ body to Joseph. Along with Nicodemus, Joseph took Jesus’ body from the cross. They wrapped the body in linen stripes and 75 pounds of mixed aloe and myrrh. The Jewish burial custom of using spices in burial linens was associated with covering the smell of the decaying body. Because aloe had little odor, possibly the aloes were used to “fix” or hold the scent of the myrrh. Near the place where Jesus was crucified, Joseph had a tomb cut out of the rock (Matthew 27:59-60). The new tomb was to be Joseph’s burial site; however, it was to this tomb that Joseph and Nicodemus took Jesus’ body for burial. After laying Jesus in the tomb, they rolled a large stone against the entrance to secure it. Mary, the Mother of Jesus, and Mary Magdalene were present and saw where Jesus was buried. The aloe of the New Testament is the Aloe vera also known as the Aloe barbadensis, Aloe vulgaris (common aloe) and the medicinal aloe. Some sources identified the aloe as the oldest medicinal plant. 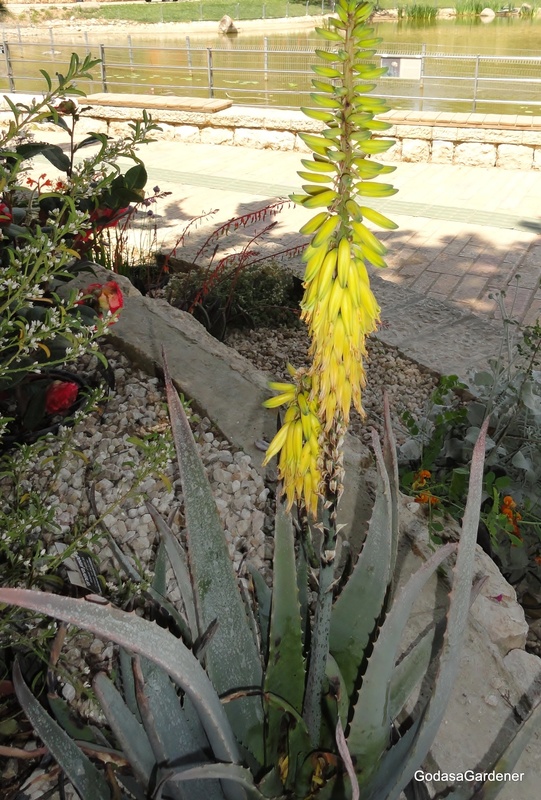 The aloe is distributed in Mediterranean woodlands and shrub-lands in hard rock outcrops including maritime sands. We saw aloe plants growing in the southern Negev Desert area in Kibbutzim Lotan and Ketura. The aloe requires full sun and can’t grow in the shade. It can grow in nutritionally poor soils and prefers sand and loam. Adult plants are drought tolerant. Aloe vera is an evergreen, perennial succulent with a strong fibrous root. When aloe is harvested for its medicinal gel, older leaves are harvested as they are larger and contain more gel. Traditionally, aloe has been associated with healing. In the book of Isaiah (Isaiah 53:5, NIV, 2002) we read these prophetic words about Christ, “But he was pierced for our transgressions, he was crushed for our iniquities; the punishment that brought us peace was upon him, and by his wounds we are healed.” Jesus body was dead; therefore, aloes weren’t used to heal him. The healing aloes in Jesus’ burial cloth exemplified Jesus’ continued healing of us even after his physical death. After Jesus’ resurrection some individuals in Judea and the Roman Empire accepted healing from Jesus. Other individuals weren’t willing to be healed. Some couldn’t comprehend that a man would die for their sins. Others simply didn’t believe that they were all that bad; why would someone need to die for their few sins? For still others it was easier to continue their same religious observances, e.g., make an animal sacrifice or give a little money into a treasury, than to accept a new way of thinking. The rationale and rationalizations that individuals used 2,000 years ago for not accepting healing from Jesus are the same ones that individuals use today. On Sunday morning in church, we pray the “Prayers of the People.” Frequently, there are prayer requests for healing – surgery, diagnostic tests, cancer – from members of the congregation. I’m always surprised that congregates don’t offer more prayers for loved ones’ spiritual healing. My dear friend isn’t a Christian; I love him so much. From time to time, I ask congregates to pray that he comes to a saving knowledge of Christ. I really should ask them to pray for him every Sunday.